The Kishu inu 紀州犬 took on the name of the region where it was bred in the mountainous districts in Kishu (Wakayama and Mie Prefecture) south of Osaka. where it was originally used as boar hunter. 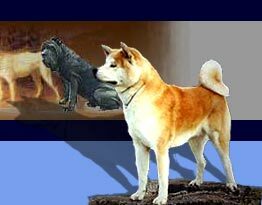 Its closest relatives are the Kai inu and the Shikoku dog, but he is also related to the Hokkaido inu. 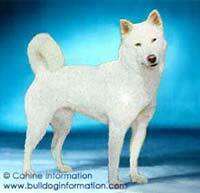 The Kishu inu differs from the Hokkaido inu by his more lenghty body. Initially, their coats were often marked with conspicuous colors such as red, sesame or brindle. From 1934, however, once the breed was designated as a "natural monument", only solid colors were accepted. Currently, white coats are the most commonly found in this breed, but solid red or sesame or also accepted. It is a very intelligent and devoted family dog that has become highly popular in Japan as a family pet. Kishus are clean, silent and docile. His skull is broarder than that of the Kai dog but narrower than that of the Shikoku inu.